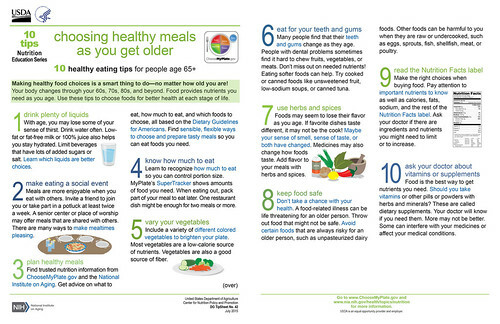 Just in time for the 2015 White House Conference on Aging, the USDA Center for Nutrition Policy and Promotion and National Institute on Aging, part of the National Institutes of Health, are co-publishing a new resource, “Choosing Healthy Meals as You Get Older: 10 Healthy Eating Tips for People Age 65+” to provide practical advice about enjoying healthy meals no matter what your age. Our bodies change through our 60s, 70s, 80s, and beyond and making healthy food choices is a smart thing to do at any age! As you get older, food is the best way to get nutrients you need. It’s important to find sensible, flexible ways to choose and prepare tasty meals. Eating is more enjoyable when you are with others, so try to make your meals a social event. There are many ways to make mealtimes pleasing. Unlock 10 healthy tips on healthy aging with this tip sheet. If favorite dishes taste different, it may not be the cook. Foods may seem to lose their flavor as you age. Shake up your taste buds by adding a sprinkle of herbs and spices to every meal. Similarly, as you age, your sense of thirst may lessen. Drink water often. Learn which liquids are better choices. Find trusted nutrition information and advice on what to eat, how much to eat, and which foods to choose, all based on the Dietary Guidelines for Americans. Together, the USDA’s ChooseMyPlate.gov offers nutrition advice, and the HHS booklet, What’s on Your Plate provides targeted content to help you choose foods for better health. “Choosing Healthy Meals as you get Older: 10 Healthy Eating Tips for People Age 65+” is available online with active online links, and as a reproducible document. For additional information, go to www.ChooseMyPlate.gov and www.nia.nih.gov/health/topics/nutrition.